Skin and Nazis. Music and propaganda. Brian Roberts, a tutor of English just come to Berlin, moves in across the hall from Sally Bowles, a cabaret singer at the Kit Kat Klub. Although she at first puts off his gentlemanly sensibilities, they become fast friends and eventually lovers. However, their love is tested by her job and the chores associated with it, a mutual friend who seduces both of them, and the political climate. Meanwhile, their friends Fritz and Natalia fall in love but worry that antisemitism might keep them apart. It’s an interesting choice for a musical to confine all the songs to cutaways at a night club (I’m fairly sure they all were), yet have each one relate to what’s happening in the story. I like the deconstruction of the “story with musical revue” format, and it also cuts down on cruft. I’m coming to realize how compelling Michael York to watch, especially in this era of his career. He brings an honesty and innocence to the role, as in the others I’ve seen him in. Also, from some angles he looks like Matt Smith. 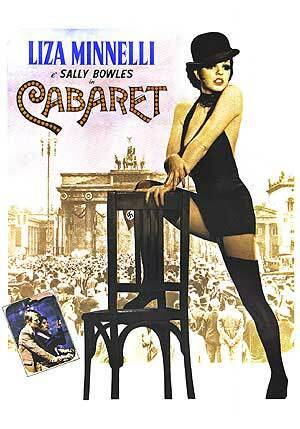 This movie also seems to sum up all the best of Liza Minelli. She can be brazen and sexual, she can be heartfelt and sincere, and she’s got a remarkable singing voice. As far as the main story goes, I don’t see how the setting affects it. It’s actually a rather generic story (aside from the bisexuality), so I imagine the thought process was “let’s do a story about Germany’s descent into Nazism… with some plot about love.” The core of the study of Germany is really in one character’s comment that the Nazis aren’t ideal, but “they’ll get rid of the Communists for us, and then we can handle them.” Later, Brian asks just how likely it is the Nazis can be handled. Watch this movie: For a love story in an exotic and familiar time, and an interesting twist on the musical genre. Don’t watch this movie: expecting much that’s actually explicit by today’s standards.